Written by Tom Ewer on November 20, 2013 WordPress tips & tricks. WordPress post tags are an often misunderstood and misused feature. Bloggers all seem to use them differently and it’s very rare to see them used consistently on a site. It doesn’t have to be this way. Tags are really quite simple if you take a moment to understand their intended usage and put a plan in place for their use. Furthermore, when done correctly, tags can be an extremely effective in improving the user experience. However, when used incorrectly they are nothing but a cluttered and bloated navigational tool that can have an adverse affect on user engagement. It’s not uncommon for bloggers to avoid using tags completely because it seems as they bring nothing of benefit to a site. That is only the case when they are used without any forethought. Tags aren’t going to change your world but when used correctly they can certainly add an extra dimension to your site. Tagging is something you should implement as soon as possible. Rather than rush over to your site and add tags to everything though, let’s take a good look at them and the best way to make use of them. Open up any good non-fiction book. At the beginning of the book you are presented with a table of contents that contains the chapter titles. These give you an idea of what information is being covered in the book and how the contents are separated out. This can be correlated to your blog categories. Now, go to the end of the book. Here you’ll find the index, which displays important words or phrases from the book. Each item in the index displays the page numbers where that word or phrase is used, allowing you to quickly locate them. Think of tags as your website’s index. Tags are a method of picking out specific details about your posts and creating a simple way to sort your content by that single piece of information. Let’s say you have a sports blog. The sports you discuss on the site would be your categories: Football, Baseball, Basketball, etc. These are the topics you are going to be talking about on the site, so they are given higher level forms of organisation. Now let’s say your latest post was about the Atlanta Falcons and your reader wants to see more posts about this team. They could go to your Football category and look for posts about the team, or you could make it easy for them by having an Atlanta Falcons tag that is linked to every post you’ve written about them. If you were a reader, which method would you prefer? Tagging like this creates a useful method of navigating around your blog and is a great way to increase user engagement. Tags should be short and contain two or three words at most. They are meant to represent important details contained within the text so they should always be relevant to the post content. The style in which you create your tags is extremely important. Using our sports website example again, “Atlanta Falcons” and “atlanta falcons” are two separate tags. If you use the title case tag on some posts and the lower case tag on others you are not linking all of your posts together. In this example you are creating two pools of posts about the Atlanta Falcons and adversely affecting your site navigation. Pick a style for your tags and make sure it’s used consistently (I advise that you use title case). Tags can be overused and underused. If you only use a tag two or three times in the life of your site then there is no point having it. It clearly isn’t relevant enough to your site and therefore isn’t necessary. So delete it. However, using the same tag on almost all of your posts is also a mistake. These tags are too general and will offer no real benefit to your site’s navigation. You can easily ascertain the value of a tag by asking the following question: When a reader gets to the bottom of the post, would the tag potentially be interesting enough for him or her to click on? Using our sports example again, if I’d just read a post about the Atlanta Falcons and that tag was presented to me at the bottom of the post, there’s a very good chance I’d be interested in reading more. This would be a relevant and useful tag in my opinion. Make no mistake: maintaining a clear and organized tagging structure can be a lot of work. It is very easy to tag something incorrectly, forget to add tags to a post or get the formatting of the tag wrong on occasion. The chances of this happening increase dramatically if there is more than one writer for your site. If you are going to use tags effectively on your blog then you are going to have to spend some time maintaining them. If you go through these tasks on a regular basis, they shouldn’t take you too long to do. I recommend you spend a few minutes each month on maintenance. That way it should always be up to date and the number of potential posts with issues is greatly reduced. If you don’t carry out regular maintenance on your tags you run the risk of having a bloated and ineffective tagging structure on your blog that is practically useless to everyone. 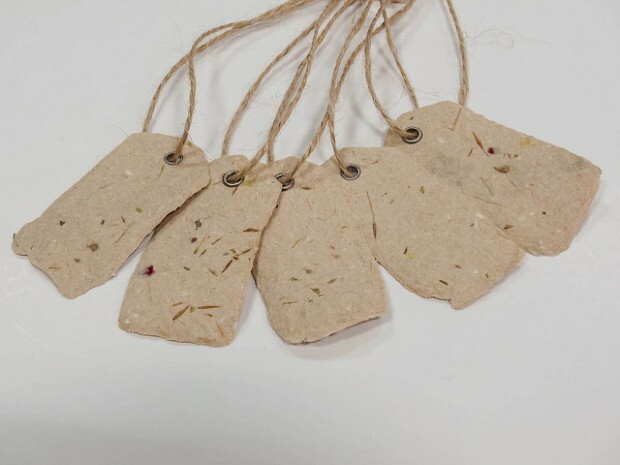 There are numerous ways to display your tags to improve their usefulness. Most blogs have tag links in the post meta section of each post created. That can be a very simple way to enable your readers to continue to read about the topic they’ve just finished. However, it may be an idea to use other methods to help showcase the tags you use. WordPress also comes with a widget that will allow you to add a Tag Cloud to your sidebar. Tag clouds are weighted lists that increase the size of your more frequently used tags while decreasing the size of your less frequently used tags. They can be a useful tool in highlighting the more important topics associated with your blog posts, but if you have a large number of tags it can look a little cluttered. 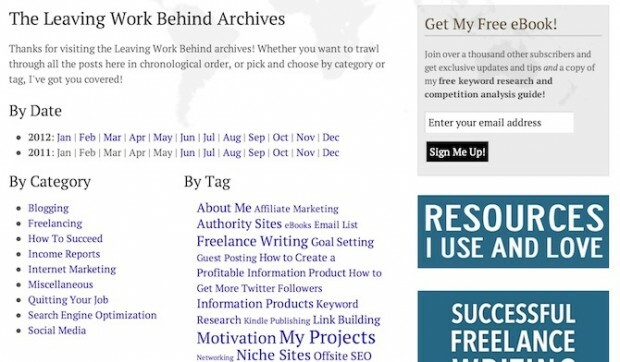 My personal favorite method of showcasing the tags is to use a tag cloud, but not in the sidebar (such as my archive page on Leaving Work Behind, shown above). I recommend you create an archive page on your site that has multiple forms of navigation, of which one is a tag cloud. This method allows you to leave your sidebar free for other important items while bringing all of your navigation methods together into a single page. Using a combination of the post meta and one of the other forms of displaying your tags will go a long way to ensuring that your readers will have easy access to the tags in order to navigate around your site. Using tags on your site is not something you need to do, but if you do plan on using them it is worth taking the time to plan out your tagging strategy in advance and enforcing it regularly. Tags can add a helpful and highly targeted method of navigation through your site. If done correctly they can aid you in building authority on the topics you discuss. If done wrong they can severely hinder the engagement and ease of navigation around your site. Do you use tags on your site? If you have any suggestions for using them to their full potential we’d love to hear from you in the comments. Great article, though I think using title case overcomplicates creating new tags, especially for some clients. I also prefer keeping them in lowercase to further differentiate them visually from categories. Regarding managing tags; is there anyway to merge tags? Marcus, but that I’m aware of, but you should check the plugin repository. One thing you could do, though, is navigate to your “Posts” > “All Tags” page. For the tag you want to eliminate, and merge into another one, click the number in the column that says “Posts.” This will take you to the posts screen with all posts that have that tag applied. You can then use the bulk edit feature to remove the old tag and apply the new one. This is the best simple explanation I’ve come across so far. This is the perfect web site for anybody who hopes to understand this topic. You know so much its almost hard to argue with you (not that I really will need to…HaHa). You definitely put a fresh spin on a topic that has been discussed for ages. Great stuff, just excellent! are tag searches case sensitive? Tags also is one of the best ways to increase traffic to your website. but, it is not simple if we do not understand about it. your article is very informative. thanks for your sharing. I like your post. have a nice day. That’s a very neat archive page. I wonder how you created it. Can you help a bit regarding archive page coding. Its really an awesome and very usefull post. I as a blogger needed to know the exact use of tags. Thanks Tom for clearing my contradicts about tags. Great post, thanks for so good info. Puts tags into perspective nicely. Do you have any info on the archive page you recommend?